A judge in Washington State wants us to lock up our guns. That sounds like it could be a good idea, but facts matter when it comes to self-defense. Most of these untested “gun-safety” ideas actually make things worse rather than better. The goal is to save lives, and it isn’t easy to do. We also have to consider how many lives the half-confiscation will cost. Honest citizens used a firearm to stop a lethal threat by killing their attacker over 1500 times a year. As a low estimate, we also have at least a half-million times where law abiding gun owners used their gun in self-defense but did not kill the criminal attacking them. Honest citizens used a gun to stop sexual assaults more than 38 thousand times a year. In the case of the half-confiscation, we would have had thousands more innocent victims dead and raped..while we might have saved 37 children from firearms accidents. Even if we’re wildly conservative, we see that gun confiscation costs lives rather than saves them. That is true if we scoop up 1 percent of the guns or 99 percent of them. We want to save children from gun accidents, but we don’t want to leave families and their children at risk from violent criminals. Now we have to look at the Washington judge’s opinion in depth. 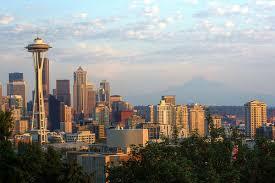 Seattle Washington said a gun has to be locked up when the gun is not in the owner’s hands. We know that safe storage will save lives in some cases. I’m a firearms instructor. I lock up my guns. I’ve bought small gun safes for family, friends, and students, but that isn’t the whole story. We have to ask how many people will die or be injured because of safe storage laws? In some cases, a stalking victim may not have the time and money for both a gun and a gun safe when she’s threatened. Will Seattle provide free guns safes for anyone who asks? Perhaps a victim of domestic violence can’t move her large gun safe with her when she flees to a woman’s shelter. That leaves the victim disarmed at the exact time she is at greatest risk. By obeying a well intentioned safe storage law, we’ve disarmed these innocent citizens when they face the greatest danger and need a gun for self-defense. Even if these safe storage laws work as intended, there will be cases when the delay in getting a firearm costs lives. Some of the million examples of armed self-defense we see each year will turn into assault and battery as the robber attacks an unarmed victim. Some of those 1500 cases where the robber was killed will end with the defender and the defender’s family being injured or killed. Aren’t there other ways to stop firearms accidents? Unfortunately, we don’t see a clear decrease in firearms accidents in states that have strict gun control. The reason is that many “accidents” happen when criminals hide their guns where children can get them. Gangs stuff their guns under the steps. Criminals hide their gun under the couch cushion or under the bed. That is where children find them and then hurt themselves or others. I teach firearms safety, but we won’t end firearms accidents even if every honest gun owner locks up his guns. It is a sad truth that criminals don’t obey gun-storage laws any more than they obey the laws prohibiting violent crime. Sadly, we live in an imperfect world. We have to do more than read headlines in order to craft good laws. We live in a country where there are over a million violent crimes every year. It is a significant fact that honest citizens frequently use a firearm to defend themselves and their family. One of the reasons it is so hard to write good gun-safety laws..
is that guns in the hands of honest citizens save so many lives. It is hard to write a law that will reduce crime and accidents without also disarming the good guys and gals who use a firearm to defend themselves every day. Without study, it is hard to know if a gun-safety proposal makes us safer or leaves us in greater danger. Fortunately, there is a very simple test we can use to find out. Look at where the law applies. Almost every gun control law has carve-outs, exceptions and exclusions. Is there is an exemption in the law for politicians, for law enforcement, or for judges? Is there an exception for police stations, for government buildings, or for courthouses? If there is an exception in the law for government employees, then it is a bad law for all of us. How strange that judges know a law is bad if it applies to them, yet they are willing to apply it to us. I gave you 800 words. Please rate, share, subscribe and comment. ← Are Mainstream Media Promoting Murder or Working to Stop It? Just ask the bad guy breaking down your door if he’ll wait while you unlock the gun safe and then the ammo safe and load your gun. Then the Coroner can tag and bag you. “How strange that judges know a law is bad if it applies to them, yet they are willing to apply it to us.” This has to be one of the best lines you have written all year! Great Article Mr. Morse. There is nothing new under the sun, including an elistist mentality. That will only be resolved when the kingdom of heaven is ushered in. Who wants to be a part of first ever, righteous rule and reign? I do.